There is a lot of false information and hearsay going around about pepper spray. Here at Revel Technology, we believe that using pepper spray responsibly, especially in our home defense system, is a safe, humane, and effective defense alternative. 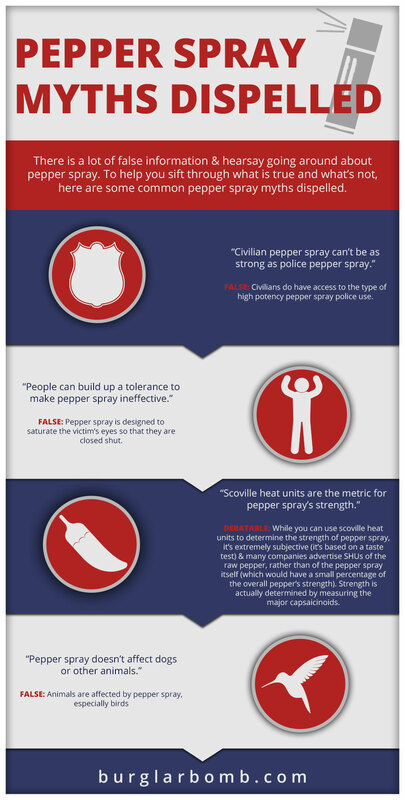 To help you sift through what is true and what’s not, here are some common pepper spray myths dispelled. This is false. While many versions of civilian pepper spray are much weaker than what police carry, civilians do have access to the high potency pepper spray police use. This is also false. Pepper spray is designed to saturate the victim’s eyes so that they are closed shut, giving you time to get to safety, even if drugs, alcohol, mania, etc. prevent pain from stopping an intruder or attacker. This claim is debatable. While you can use scoville heat units to determine the strength of pepper spray, it’s extremely subjective (it’s based on a taste test) and many companies advertise SHUs of the raw pepper, rather than of the pepper spray itself (which would have a small percentage of the overall pepper’s strength). Strength is actually determined by measuring the major capsaicinoids. Bear spray is essentially a high potency pepper spray for bears, and even civilian pepper spray will severely affect dogs and cats. Birds are especially susceptible to harm from pepper spray. This is true. The Code of Federal Regulations, 49 CFR Part 175.10, states that crew members, passengers, and air operators may carry up to four fluid ounces of pepper spray, as long as the device holding it has a means to prevent an accidental discharge. This is true. Oleoresin Capsicum is the ingredient that is pulled from natural peppers to produce the pepper spray commonly used by civilians and police. Here at Revel Technologies, we have perfected our pepper spray home defense system to help keep you, your loved ones, and your property safe from a potential intruder. We have different home defense options, depending on your needs. For instance, our Interceptor model only detects moving objects above a certain height, allowing for pets to move freely about the house without risk of triggering the defense system. If you have questions about our products, how they work, or our delivery methods, please don’t hesitate to give us a call today. One of our knowledgeable and friendly representatives will be happy to answer any questions that you may have. 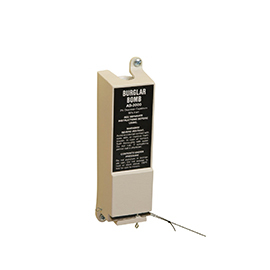 The AB-2000 forces intruders to leave in seconds empty-handed. Our pepper spray security devices are so effective, police response isn't needed. 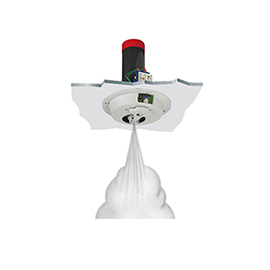 Add muscle to your home security alarm system with the Repulsar I pepper spray anti-burglary upgrade. 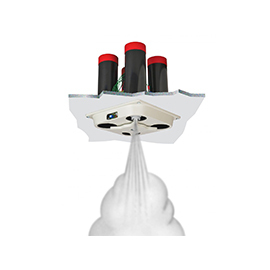 To control larger areas and add versatility, upgrade your security system with the Repulsar IV. 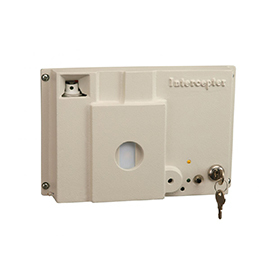 The Intercepter pepper spray security device protects your family from burglaries and home invasions more effectively than any home alarm system in existence.